The Second World War did not thwart Modernism in Metro-land. The much bombed areas of East and Central London attracted the grander post war buildings such as the Royal Festival Hall, Centrepoint and the Barbican, but Metro-Land still attracted the progressive architect. Post-war churches flourished in North-West London, with excellent examples of the type in Ruislip, Northolt, Hanwell and elsewhere. The Central Line extensions stations from North Acton to West Ruislip demonstrated how Charles Holden’s influence lived on through architects such as Brian Lewis and John Kennet and Roy Turner. 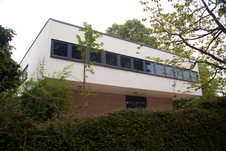 Modernist private houses proliferated throughout Highgate and Hampstead, and further afield in places like Elstree and Edgware. C.G. Stillman took over as Chief Architect for Middlesex County Council from W.T. Curtis and continued his progressive school building programme. Offices from the likes of Owen Luder and Erno Goldfinger replaced the factory building of Wallis, Gilbert and Partners as service industries replaced manufacturing. The only building type to suffer in the post war period was Cinemas. Many of the Art Deco wonders from the 1920’s and 30’s were demolished or redeveloped, and new cinemas were only built in new towns such as Hemel Hempstead and Harlow.